For the last year, my husband, his father, his grandfather, and his cousin and I have been working off and on updating the master bath at our house. We’re not quite done, but we’re finally at a point where we can use the shower and sinks. Yippee! 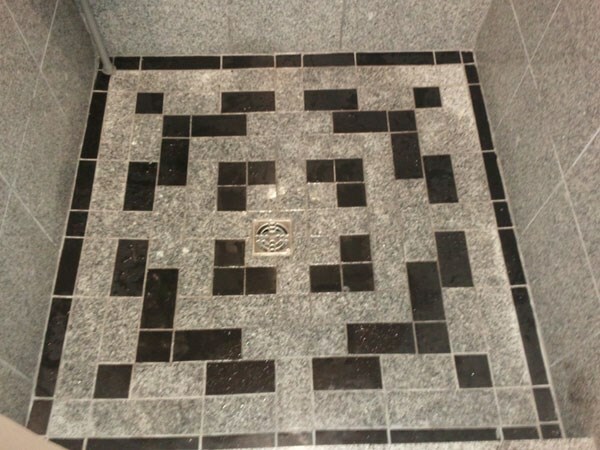 When it came time to design the shower, we looked into buying pre-made mosaic floors, but those cost upwards of $500 for a 48″x48″ design. Our floor was more like 45″×47.5″, so we were concerned about how that would impact any design we purchased. 1. I measured the floor. 2. 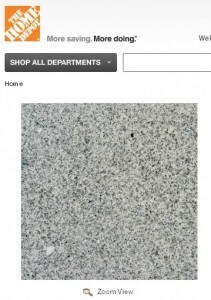 Our tiles came in two colors (black & pepper gray) and the granite was 12″ square. 3. The smallest we were willing to cut was 3″x3″. 4. Our drain was slightly off-center, so I measured that distance from the back and left walls. 5. I asked how wide we were going to make the grout lines. 2. I clicked QUILT > New Quilt > Horizontal Quilt. 3. 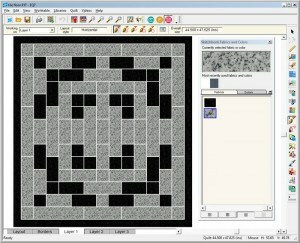 On the Layout tab, I set the block size to 3 x 3. 5. I had no idea where my camera was, so I went to the website for the home supply store that we had purchased our tile from and found images online of the two tile colors. I right-clicked the images and chose Save As. 6. I went to the new EQ7 Image worktable and imported the first image. I cropped it and chose IMAGE > Add to Sketchbook as Fabric. Then I did the same for the second tile image. 7. Back on the Quilt worktable, I started clicking on the squares in the quilt with my tile colors. I CTRL+clicked the “sashing” a.k.a. grout lines with a solid gray. 8. 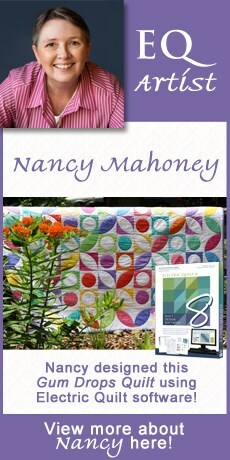 With the help of many eyes, we colored the quilt on the screen in a fun pattern. 9. After the quilt was initially colored, I right-clicked it and unchecked outline patches and outline blocks. That let me see the “field” without the black outlines. 10. The first version of our floor looked very block-y. There were too many grout lines. 11. So,… I started coloring the sashing in the spaces in between two matching colors that same color to signify that instead of having two 3” squares with grout in between, we’d have one large 3” x 6.125” rectangle. This meant I could only join 3 squares in a row (3×3=9, + 1/8 + 1/8 = 9.25), because 4 squares in a row would be larger than my 12″ tile size (4×3=12, + 1/8 + 1/8 + 1/8 = 12.375). 12. So once again with the help of many eyes, we joined the square together in a pleasing (and symmetrical) pattern. 13. I printed off the quilt and did a quick count of how many 3″ squares we needed of each color, how many 3×6.125″ rectangles, and how many 3×9.25″ rectangles we needed. 14. My father-in-law used the quilt printout and my notes as his cutting guide. 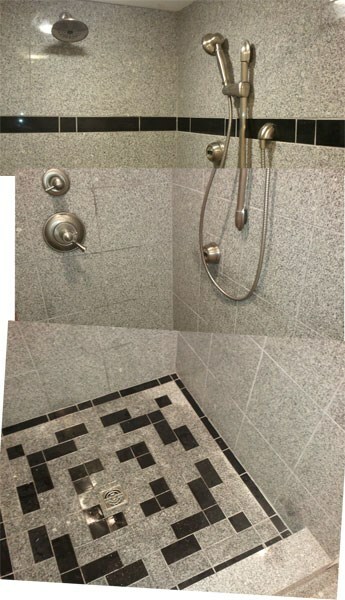 The final shower floor is amazing. I can’t wait until the rest of the bathroom is done.